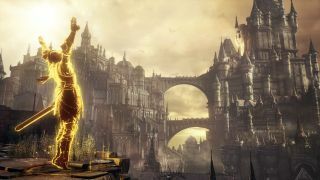 I spent two hours with Dark Souls 3 last week, and while the only platform available was PS4, it's an impressive visual leap over its 2014 predecessor. Enemy animations are fluid and detailed, the environments are gorgeously morose, and while 2015 PS4-exclusive Bloodborne has definitely influenced the Souls series' direction, the marginally quicker combat is still heavily reliant on defence. The video above contains some of my impressions of the game world, as well as evidence of some direct connections between Dark Souls 3 and the original Dark Souls. Below is some unedited footage from the Undead Settlement area, culminating in one of the most spectacular Souls boss battles I've yet to see. Be sure to check out Tom Senior's thoughts as well. Dark Souls 3 releases on April 12.